After some five years here in Toronto, Blackburnian and I decided it was time for a change, time to move on. Neither of us are city people, and when circumstances allowed that we could move back out to the country, we jumped on it. We’ve spent the last three weeks or so driving around a good portion of southern Ontario checking out house listings, which, it turns out, are few and far between when you’re looking for a rental (we want to both save up a bit and also make sure that we really want to be in the area before we commit to investing in a home). Yesterday we spent a long day on the road, checked out four listings, two of which we absolutely loved. The view from the one of them finally won us over, and we went back today to take care of paperwork. While we were out that way (it’s nearly three hours from where we currently live, so not exactly around the corner!) we revisited the house to take some measurements and also some photographs to share with people. It was the view that really drew us to the place, and the general setting. 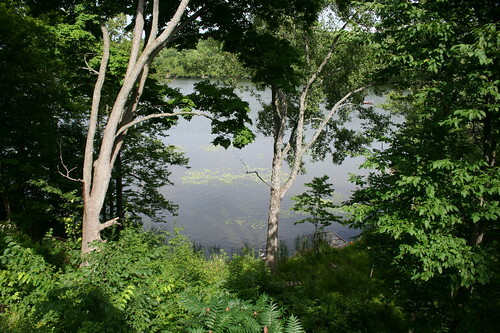 It’s right on a shallow lake, with the house at the top of a small rise, looking through the trees at the water. It’s surrounded by forest, with small open patches here and there. Unfortunately, both days we visited it was later in the day, past the hour when birds would be active and singing, but it’s starting to get late in the summer to hear much anyway. The timing of the move isn’t great for experiencing the local bird life (we may have to wait till next spring for most of the residents), but we’ll get to see all the migrants through the fall and feeder birds in the winter, and in the meantime there’s still lots of other wildlife to be seen. A view looking up the lake from the dock. It’s a relatively small lake, and quiet. Apparently most of the water traffic is human-powered, with just the odd motor boat going by. The other shore is only about 200 meters/yards away, an easy paddle, or even an easy swim if one was so inclined. 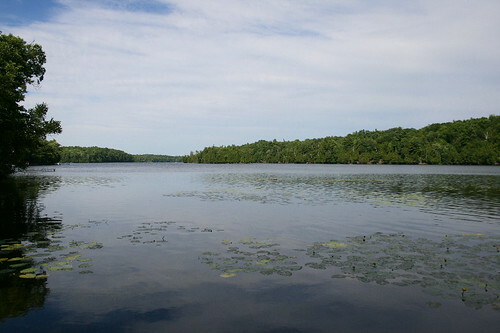 The other shore is part of Frontenac Provincial Park, another reason why boat traffic is quiet. A short canoe paddle will take you to miles of hiking trails through relatively untouched wilderness. 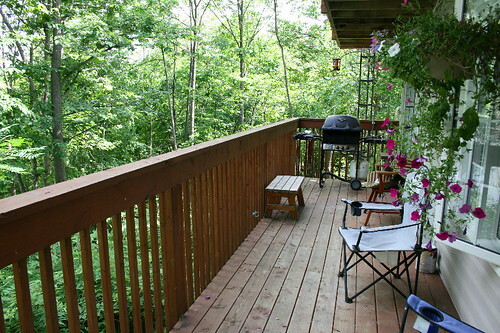 Part of the 2 acre property swings out into a little point. This is looking back toward the dock and shoreline from the point. The water in this area is fairly shallow, only a couple feet deep through most of it. 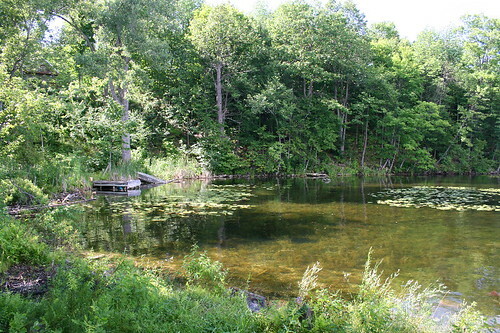 The water is pristine and clear, and you can see right down to the gravelly bottom. There are plenty of fish in the water, and what I would consider to be larger stuff (fisherpeople would scoff at that description, I know), bass and sunfish and others that are easily six or eight inches long. There are even bass spawning beds in the gravel just offshore (Blackburnian had to point them out to me; he used to fish and knows all this stuff much better than I do). To make up for the lack of birds while we were there, other stuff put in appearances. 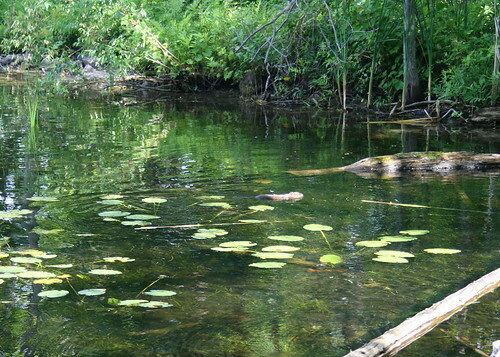 Here’s a muskrat that was paddling around in the lilypads just off the dock, while we were standing there. 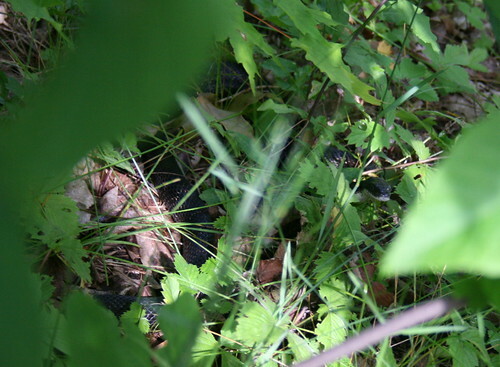 And a Black Rat Snake that we startled from the shrubs at the edge of the lawn (I’m actually not sure who was more startled, the snake or us). It’s the first one either Blackburnian or I have seen in Ontario, where their range is extremely limited, and the species is declining and listed as threatened. They’re only found in a few patchy locations in the southwest, and in the Frontenac axis in the east. Unfortunately, I only had my wide-angle lens on the camera, not anticipating to be taking photos of wildlife. It seems that there will be lots of good fodder for future blog posts from there! Not sure if you can tell, but I’m excited to move! We officially take possession August 1, but are hoping to arrange to be in a few days earlier, if possible, both so we could overlap the move with our last day at this apartment, but also simply because we’re really looking forward to moving in! Congratulations! What an exciting move. I can hardly wait to see what comes off your camera and computer from this juicy location. I am very happy for you, this looks like a really good live choice. Wow – very cool – I’m jealous! Hope you enjoy your new home, and look forward to lots of new posts! Congratulations — it looks like a little slice of heaven! Enjoy! Wow- What a place! I can’t wait to see what you uncover here. Looks lovely. Can’t wait to see what kind of nature posts this place turns up! Thanks everyone! We’re pretty excited, looking forward to getting settled there. Less than two weeks away – the countdown begins! Congratulations on the new place — how wonderful to be able to live in such a beautiful location, and right on the edge of Frontenac, too! I’ll bet it will be hard to find time to blog when there’s so much happening outside your door. Thanks, eyegillian! Indeed, I’m going to have to discipline myself not only to get blogging done (which shouldn’t be too hard, I’ll probably be eager to share my discoveries on the blog), but also to get actual paying work done, given that I work from home! I have a feeling there will be tons of birds. Sooo excited about your ponds, you lucky duck. Maybe the black rat snake explains the dearth of birds? Just kidding. Bill found two enormous ones in our garage when he cleaned it but we still seem to fledge a few birds around here. 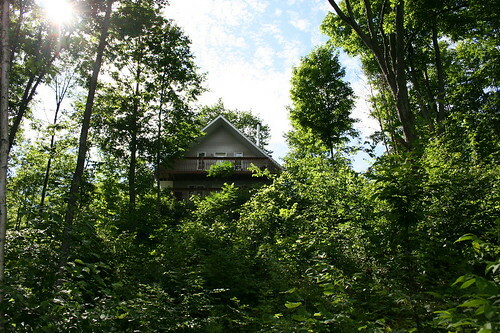 Isn’t it marvelous to have your own place in the woods! Congratulations!